We are successfully engaged in trading of high quality Himalaya Face Wash for our valued clients. 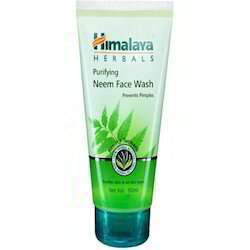 Himalaya's Purifying Neem Face Wash is a soap-free, herbal formulation that clears impurities and helps clear pimples. Himalaya's Purifying Neem Foaming Face Wash, developed after extensive research, is a combination of Neem, Turmeric and Vetiver.